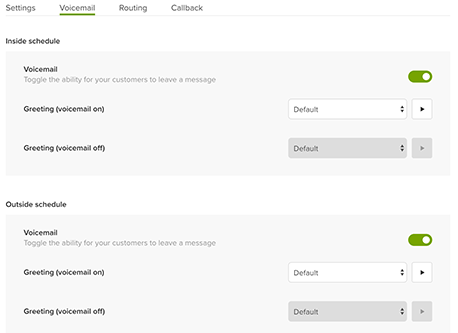 When you can't answer calls, Zendesk Talk has built-in voicemail. When customers leave a voicemail, a ticket is created with the voicemail attached. Additionally, you can optionally transcribe the voicemail right into the ticket. Customers can leave a voicemail of up to two minutes in length. In this article, you'll find the information you need to set up and configure voicemail. Click the number you want to edit voicemail settings for, then select the Voicemail tab. Configure the settings you need from the following table. Voicemail Turn voicemail on or off. By default, voicemail is enabled. For details, see Managing greetings when voicemail is off below. Note: Customers on the Lite plan cannot disable voicemail. Greeting (voicemail on) Select the voicemail greeting that customers hear when voicemail is on. This field is shown only when voicemail is enabled. Greeting (voicemail off) Select the greeting that customers hear when voicemail is off. This field is shown only when voicemail is disabled. For details, see Managing greetings when voicemail is off below. Make sure to use a greeting that doesn't instruct customers to leave a message. For details on creating greetings, see Creating a custom greeting. Transcribe voicemails? Turn transcription on or off. By default, voicemails left in English are transcribed into the resulting ticket. Other languages are not transcribed. Delete voicemails after Automatically delete voicemails after the selected amount of time or select Never to always keep voicemails. Although voicemails get deleted from a ticket, any transcriptions made from a voicemail are not deleted. When you disable voicemail for a number, customers won't have the option of leaving a message. Accordingly, greetings that usually prompt customers to leave a message need to change when voicemail is off. The default Available agents greeting, which is in the Settings tab for each number, also prompts customers to press 1 to leave a message. When you disable voicemail for a number, we automatically update the Available agents greeting for when voicemail is off to a version without the prompt for customers to leave a message. The Available agents greeting only applies to group routing. If you have IVR enabled, the available agents greeting will not be played. See Routing incoming calls to groups of agents and Routing incoming calls with IVR. Note: This behavior applies to newly-added numbers only. For numbers added prior to the availabilty of voicemail disabling: When voicemail is disabled for the first time, the Available agents greeting is replaced with the Available agents greeting you have set for voicemail on. Make sure you change your greeting to a version that does not prompt customers to leave a message. If you want to change the Available agents greeting to a custom version without the prompt for customers to leave a message, you can create your own version (see Managing outgoing greetings) and then manually change it yourself following the steps below. Click on the number you've disabled voicemail for that you want to edit. In the Settings tab, select your customized version in the Available agents greeting (voicemail off) field. For details, see Routing calls based on business hours (Talk Team, Professional, and Enterprise). I think I have Talk basic, but to be honest, it doesn't show what level I'm at under Subscription. However, I must be at a level lower than Basic, because these settings do not appear for me. It looks like you are on a legacy account, and that's why you're not seeing these settings. What are you trying to do? I'm hoping to setup a voicemail greeting for closed hours that will automatically turn on as soon as we are closed. And have our vm greeting for open hours turn on when we open. Thanks for the details, Joel. You'll need to move to at least the current Talk Basic plan in order to have access to business hour voicemail configuration. Take a look at the Talk pricing page, and let us know if you have additional questions. As a quick tip, if you are going to upgrade, I'd do it ASAP, as there's a pricing change coming up soon. Thanks. It would cost us an additional $864/year to go up to Basic. Since business hours is really the only feature I'm looking for, I don't think it will be worth it. There is a slew of features listed under Features, but the Pricing page only lists a few of those features, so I don't know what else would come with Basic. The compare plans page should provide more detail. Let me know if that helps at all. I'm a bit more confused, to be honest. How do Basic and Advanced fit into Team, Professional, and Enterprise? Apologies for the confusion. As I mentioned in my comment on the 1st, the "upcoming" pricing structure change happened this week, deprecating Basic and Advanced and shifting to the Lite/Team/Professional/Enterprise pricing structure. So instead of Basic, you would now need to move to the Team plan in order to obtain business hours for voicemail. Thanks for clarifying. Now it will cost an extra 2 grand a year. I am perfectly happy manually changing my vm greeting daily at that price. It should be the toggle switch that shows up to the right of "Voicemail" as in the first image in the article above. I have loaded a short music clip (:08 sec) for both "wait" and "hold" but it appears that ZD is looping the clips and callers have to sit through the music for a long time even when agents are available. 1 - is there a loop setting somewhere that i am not seeing? 2 - why would this be happening if agents are available? 3 - if no agents are available, why can't we let the caller go straight to voicemail instead of having to sit through the available agents message and the music, only to be told no agents are available. if we know no agents are available, why do we have to tell them, please wait while we search for available agents? What you're describing doesn't sound like intended behavior. There is no loop feature in the IVR. Could you please reach out to our Support team at support@zendesk.com to look at some specific examples of where this is occurring in your account?